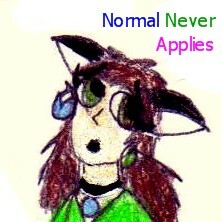 If you look at the Statistics page, you can see how many different types of Neopets there are in Neopia. If you scroll down to the bottom, you will see that the least popular normal Neopet (i.e. ones that you can adopt, not the limited edition ones that require a lab ray or potion) is the Gnorbu. Aww, poor Gnorbu! Before you start pitying the noble Gnorbu, consider this- underdogs always have a loyal following. And if you saw a Gnorbu, you’d know what one is. I dare say you know some famous Gnorbus, such as the wise old Gnorbu who lives in the Shenkuu Lunar Temple, or the beautiful and brave princess Gnorbu who longs to become a Shenkuu Warrior. However, if you were out enjoying the countryside, and saw a pair of amber eyes staring at you inquisitively, well camouflaged amongst the foliage with its stripes, rebellious mane and tufty ears, would you know who was watching you? If this has happened to you, you are lucky enough to have encountered an Ogrin. A look on the Stats page will show you that Ogrin are the second least popular (normal) Neopet, but they do not share the Gnorbu’s fame. What stops the Ogrin from being a well known and well adopted Neopet? 1)	Ogrin are very shy pets, and so they get cast aside when people are looking for a new Neopet. If you want a fierce Battledome contender, then you’re best off looking for a Lupe. If you’re after stripes, then a Kougra is an ideal catch. If you’re looking for something more domestic or horsey, then a Uni will shriek “pick meeeeeee” before you even notice the Ogrin watching you from the corner. 2)	There are no famous Ogrins for Neopians to have as role models. This means Ogrin awareness is pretty low. 3)	There is not much in the way of Ogrin merchandise to tempt you into getting to know this pet better. It also means that if you already own an Ogrin, it is hard to buy things specifically for it. 4)	Currently, there are only 16 different colours you can paint your Ogrin. This makes them the second least customizable pets behind the mega-rare Lutari, who you can only paint 6 colours; Red, Yellow, Green, Blue, Island and Pink. I have already mentioned that the Gnorbu is the least popular (normal) pet, and they can only be painted 20 colours, bringing them in 3rd behind Ogrin. Compare that to the most popular of all pets- the Shoyru, who can be painted a massive 45 different colours. Coincidence? You decide. It is a shame that Ogrins do not sell themselves better. They make wonderful companions. They’re not vain or snappy or constantly hungry like SOME Neopets. Instead they are calm and intelligent, and they love to accompany you on walks. Earn an Ogrin’s trust and they’ll tell you interesting things about Neopian nature that you’ve never heard before. Their wild mane might make you think that an Ogrin is untameable too, but nothing could be further from the truth. Their shy nature means that they try their best not to upset you because Ogrins don’t like confrontation. You may be lucky enough to be told a cheeky joke (being intelligent, they remember all sorts of jokes) but an Ogrin will never be cheeky to you. Ogrin prefer to learn, not to battle. They simply aren’t designed for fighting- they don’t have sharp claws or big pointy teeth and they are not at all aggressive. 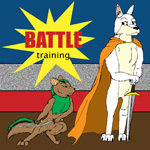 However, if they need to, they can look after themselves pretty well in the Battledome, especially if you train them well. They love to take walks around Neopia, so they have very strong legs that can give a nasty kick if you get too close for comfort. And if that doesn’t work, those legs will carry the Ogrin away pretty quickly too! Compared to most Neopets, Ogrins are not hard to look after either. They do not require constant grooming, they will munch on plants whilst outdoors so they are not big eaters, and they are happy with a slow stroll outside to enjoy the sights instead of frantic exercise. One slight setback is that they need a lot of mental stimulation. You’ll need to buy plenty of books if you want to keep your Ogrin happy. One great way to occupy an Ogrin’s mind is to play Hide and Seek. Ogrin are very good at it, as their camouflage makes them almost impossible to find! They might give themselves away though with a mischievous little giggle if they see you walk past them without noticing them. Their love of the outdoors make Ogrins the perfect companions to travel with. In fact, I doubt you could get a better buddy if you like to visit the different worlds of Neopia. Given the fact that Ogrins love studying nature, they make excellent guides if you want to go exploring. An Ogrin will relish the changing scenery, and won’t be asking “are we there yet?” every half an hour. Ask nicely, and they may even help you carry your belongings. Being placid creatures, Ogrins also make good petsitters for younger Neopets or Petpets. My Ogrin absolutely adores her Schmoonie. They are sensible and would take their responsibilities seriously. They certainly would not let the little ones get up to any mischief. Who knows, maybe your youngsters could learn something from their Ogrin nanny. So if you’re thinking about getting a brand new Neopet, consider an Ogrin. Whilst generally calm and level-headed, they can be playful too, and enjoy a nice frolic in the forest every now and then. These friendly Neopets are so unique that they do not deserve to be cast aside for the more popular pets. It is true, you cannot give an Ogrin an individual streak due to its lack of colours. But still, if there are so few about, they’ll be individual anyway. Besides, an Ogrin looks very striking as it is; everybody knows that stripes are very slimming! It just depends on if you want to buy the paintbrush or candles.